A Saturday evening party was one part of our 15th Anniversary Celebration Weekend. In December 1997, a group of men and woman convened at a private home for worship and study and to work through their idea of a synagogue community. Over time, and as more people attended the monthly services, the gathering evolved into a congregation. And although many of the congregants were no longer in the spring of their own lives, they named this burgeoning congregation Bet Aviv–House or Tent of Spring–tent for its welcoming policy of inclusion and spring to symbolize its energy and the power of Jewish community to renew lives at every juncture. Soon, the group was guided to Rabbi Marc Lee Raphael, who conducted his first Bet Aviv service in May 1998. Not long after, the synagogue settled into a neighborhood center, Amherst House. Morris Levine, the first President, had the foresight to set aside reserve funds which allowed us to move in fall, 2004, as permanent owners, to the Meeting House in Oakland Mills. It felt like home, especially since it was in this space that, from the beginning, we had held our High Holiday services. 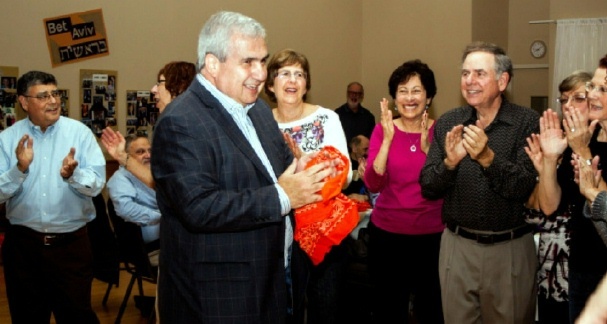 After Morris’s term, Saul Lubitz assumed the presidency, followed by Barbara Hurwitz, Sami Klein, Howie Feldmesser, Richard Tobin, co-presidents Geri Epstein and Marty Stein, Lynn Green, and Bill Salganik. Our current president is Richard Rosenblatt. Each president brought his or her own talents and strengths to the position and left an enduring legacy. Founded with approximately 35 families, we are now 249 families strong. We have celebrated several bnai mitzvot, including a memorable one for nine adult women in 2005 and our most recent one for six adults in November 2016. On our fifth anniversary, we retold the Bet Aviv story in narrative and song. We celebrated our 10th anniversary in November 2008 and our 20th anniversary celebration weekend in June 2018. In May 2011 we bid a fond farewell to Rabbi Raphael as he retired, having served as Bet Aviv’s spiritual leader since its early days. In July 2011 we welcomed Rabbi Seth Bernstein as our new spiritual leader. In July 2014 we welcomed Cantor Linda Baer to lead us in song. Beyond our twice monthly services, led by Rabbi Bernstein and Cantor Linda Baer and enhanced by occasional appearances by the choir, Bet Aviv has, since its founding, demonstrated its commitment to social action and study through adult education classes. We have a strong Sisterhood and a growing Men’s Club. Recently we added a Caring Committee and social groups like the Camera Club, Genealogy Club and a second Book Club. Since its inception, Bet Aviv has flourished and grown without sacrificing its original intent to construct a vital synagogue community, enriched with experience and welcoming to all.